My niece and her husband win for best costume. Unfortunately for them, there is no prize. 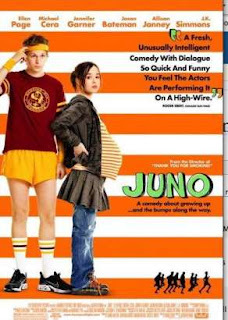 She is expecting their first child, so they went as "Juno". I love it!!! And here are Sam and Drew. When I am old and lonely this picture of them together will be fun to look back on. Unless Sam grows up to be, I don't know, sparkly, and Drew actually grows up to be violent, then it might creep me out. Also, did you dye Drews hair? Or is it a wig? That is a great costume!!! Too bad they don't win a prize! Your kids are great - I'm sure they won't be sparkly or violent! Cute costumes, too. Love both the costume sets. That is hilarious! They so take the prize. By the way I really liked that movie, as bizarre as it was. The kids were cute too! Rachey - we didn't dye it OR get a wig! He's been growing it long - yesterday I finally made him let me trim it and he was so upset he wore a hat to school. We were walking around with them all night, and it was pretty hilariosu the looks Ryan was getting! That is one diddle that can't be undid, Homeskillet."